The hottest app for political candidates to reach voters in 2016 is not an app at all. It is the vintage Text Messaging technology that is allowing presidential candidates to quickly and effectively communicate to supporters. SMS and MMS activations are a great way to cut through the clutter of virtually any other channel and deliver a message that almost 100% of the time will be read. No need for app downloads or external hardware. Everyone with a mobile phone can participate in the presidential candidates' text clubs! Unite and Rally Voters - SMS and MMS message is a great way to reach supporters and voters. With our society overwhelmed by Email, Facebook, Twitter Instagram and Snapchats, text messages cut through the clutter of every other channel and are guaranteed to be read. Campaign Events Alerts - Send out campaign events invites via SMS. Let supporters know when and where the next rally is. Voting Day Reminders - Increase voters' turnout. Remind people to get out and vote on Election Day. Mobile Polls - Effective way to gage supporters' opinions on important campaign elements. Results tabulate quickly electronically and are available to view at any time. Text Donations - Extremely effective and direct donations mechanism with proven track record. 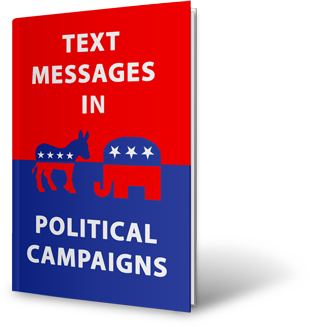 All you need to ask your supporters is "Text KEYWORD to 82257 to make a donation to our cause"
Get a FREE Copy of "Best Practices for Using Text Messages in Political Campaigns"